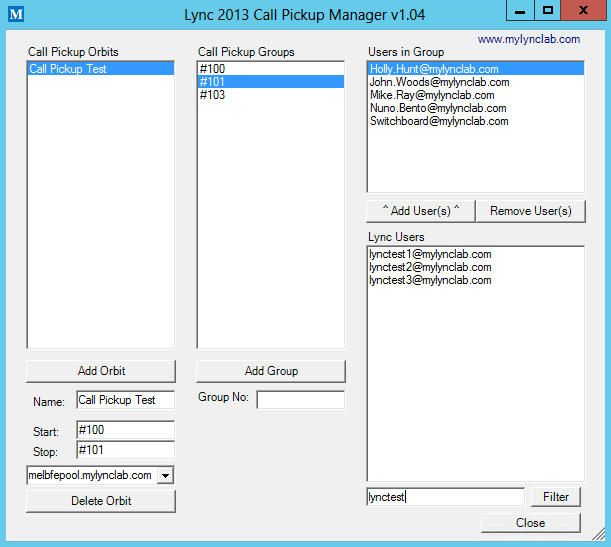 In Lync 2013 Cumulative Update 1 (February Update) Microsoft added the new call pickup group feature. Call pickup has been a classic voice feature since the very early days of PBXs. As a result, lots of businesses are still used to being able to answer other people’s calls by dialling special access codes from their phone. So it’s great that Lync finally has this capability to help ease some of the pain points for businesses transitioning from their previous traditional PBX systems to the new world. Calls coming in to any member of a call pickup group can be answered by dialling a special access code for that group. Note: the person wanting to answer the call will physically need to hear the other person’s phone ringing. Any other user on the system can answer a call to a call pickup group by dialling the call pickup access code associated with that group. This feature does not restrict the call to only be answered by people in the group. If there are multiple calls ringing on phones in the same group, the first call into the group is the call that will be answered when the access code is dialled. The other calls in the group will be queued in the order the calls came into the group after that. Users can be assigned to only one call pickup group at a time. Call pickup service uses the call park services running on the Lync front end server. When a call rings on a call pickup group user’s number it will simultaneously be automatically parked on the call park service. If the user picks up the phone the parked call is removed, or if the call pickup number used to answer the call, the user’s phone will stop ringing. Calls into a call pickup group can be answered by any phone within the organisation, as long as the user wanting to pick up the call knows the correct access code to dial for that group. Response group calls ringing on a call pickup group user’s phone cannot be answered via call pickup. Delegate Calls – Calls delegated to another phone cannot be answered with call pickup. Team Calls – Calls to users with team calling configured cannot be answered using a call pickup access code. Simultaneous Ring Calls cannot be picked up with group call pickup. Unfortunately, configuring call pickup groups has not been very easy to do (till now), due to Microsoft only giving access to configure call pickup groups through the very archaic SEFAUtil from the Lync Resource Kit (ResKit). This tool was originally designed to be used for administratively configuring Call Forwards and Team Calling by running commands from the prompt. SEFAUtil can check which call pickup group a user is in, or set which group a user in, via the command line. A big problem with SEFAUtil is that it usually takes 3-5 seconds to check the settings for each user, and another 3-5 seconds to change their setting via the command line. In addition to this, you can’t directly query a call pickup group number to see which users are in that particular group. Instead, you have to query each user individually to establish the call pickup groups of which they are a member. If you think about that, for 1000 users it could take you (1000 x 5 seconds) well over an hour just to discover which groups all the users are in. This seems a little excessive to me. So after many evenings in the lab scripting away, I have created a tool that will hopefully make life (when it comes to call pickup groups, at least), a bit easier. So what does it look like? View all call pickup group configuration (Orbits, Groups and Users) in one simple interface. Call Pickup Group Manager discovers call pickup configuration information directly from the Lync database, to avoid having to poll every user individually using SEFAUtil. This makes configuration discovery super fast! Easy configuration of Call Pickup Orbits. Group-centric configuration of groups. ie. you attach users to a group, rather than groups to a user like the SEFAUtil tool would have you do. Multi-selectable user list boxes for adding or removing multiple users at once. If SEFAUTIL gives no response (due to an unknown error in SEFAUTIL) the tool will display an error to the user. Added the Import-Module Lync command in case you run the script from regular Powershell or use the Right Click Run using Powershell method to start the script. This version has been updated to handle Common Area Phones. Some people reported errors being displayed by the tool when they had manually set (with SEFAUTIL) Group Call Pickup against Common Area Phones (ie. against the SIP URI of the Common Area Device, eg: sip:fbcb642b-f5bc-477a-a053-373aef4c00f8@domain.com). As of this version Common Area Phones will be included in the user list, and you can add and remove them from Call Pickup Groups. User listboxes are now slightly wider to deal with the long SIP addresses of Common Area Phones. When the tool loads it will display in the Powershell window the SIP Address and Display Name of all common area devices so you can match the (GUID looking) SIP address in the tool to the display name of the device. Added Filter on Lync users listbox to cater for deployments that have lots of users. Under the hood, the Call Pickup Manager will use the SEFAUtil for adding and removing users from groups. This was a deliberate choice, as I wanted the tool to be supportable by Microsoft (ie. by avoiding any direct database editing, or hacking of things), and you don’t have to fear any unnecessary database corruption from using the tool. Make sure you have the ResKit installed on the Front End server you are running the Call Pickup Manger Tool on. I have written prerequisite checks into the tool, so you will get an error in the console window if it's missing. Once the resource kit has been installed you need to configure Lync so it will trust the SEFAUtil tool. This allows the SEFAUtil to make UCMA calls to the Lync system. In order for the Lync 2013 Call Pickup Manager to quickly download call pickup settings from your deployment, it needs access to your RTCLOCAL databases for each pool. If you only have one Standard Edition server, then you can run the tool directly on this server and it will be able to access the RTCLOCAL database directly (note: this is also the case for an enterprise edition pool, but you need to run the tool on the first server in the Get-CsPool -> Computers property array, because this will be the database the tool tries to connect to). If you have multiple pools, the Call Pickup Manager will try and connect to each pool to download all the call pickup data for each pool (Branch SBA's also count as a separate pool). You can add Firewall rules either through the Windows Firewall settings in Control Panel, or by the command line. In this example I will show you how to add the ports using the command line. 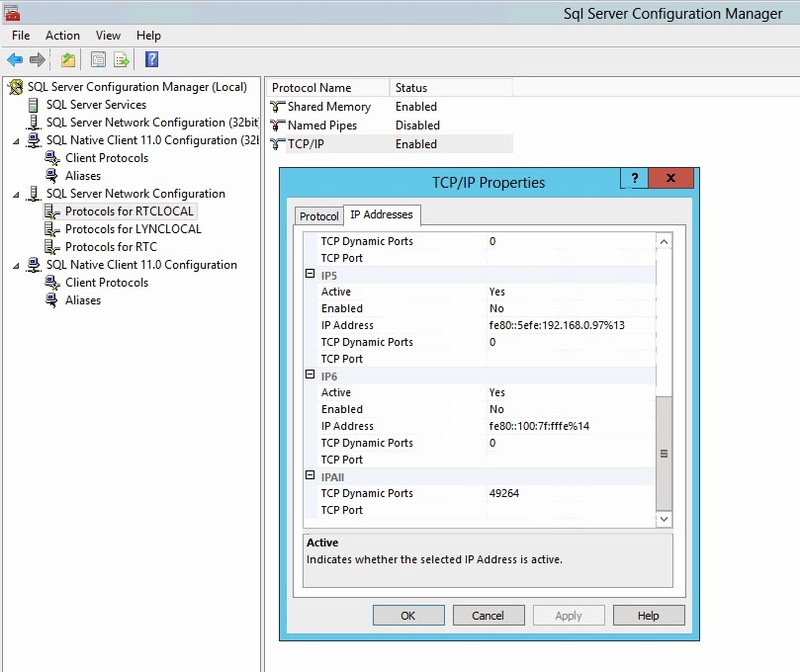 Step 2: Find the Dynamic TCP port used by the Named Instance (RTCLOCAL). 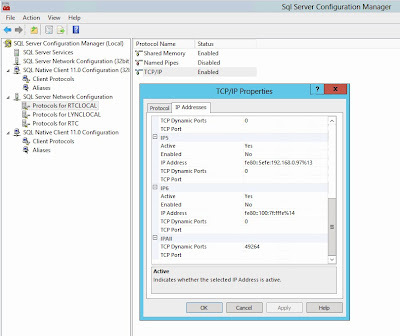 Firstly, open the SQL Server Configuration Manager (On a Standard Edition server, this is installed when the local databases are deployed). As you can see in the example below, for IPAll the TCP Dynamic Port is 49264. This is the Dynamic Port for this Named Instance that needs to be opened in the firewall. Run this script on the server you want to open the SQL Browser and RTCLOCAL Dynamic TCP SQL ports on. Once again, we’ve come to the end of another show. I hope you like my new tool and it makes your life a little easier. If you find any bugs or have any issues with it, please report them back to me so I can update the tool. Until next time, remember to answer your phone, and if you don’t, at least remember to get someone else to dial #110 to answer it for you. See ya next time!